As most of you know, I am married to a very expressive, very artistic, very capable man. And since I have been with him quite some time now, I have finally learned the following lesson: “never judge his creation midway through”…it is just wrong to do. And if I open my mouth too soon, offering my extremely valuable criticism, it is usually detrimental to my well being and his (on a small scale, just means I get chewed out for not understanding the direction of the work, and he in turn is frustrated by my lack of vision). Anyway, the reason I can’t come midway into his projects is because he pulls inspiration from, as I call it, “the sun, the moon, and the stars.” His thoughts and vision are so vast and so abstract, yet he manages to meld them together into visual genius. Most of the time my practical reasoning just can’t keep up. So it was a few weeks ago when this type of vast and abstract thought process took a hold of my beloved and he garnished a two hour window of our Saturday morning pulling the “sun, moon, and stars” into a family conversation that seemed to be headed nowhere. I promise you he used the phrase, “my point is…”, several times and yet my daughter and I looked at him and said, “I still have no idea what your point is!” Now periodically, like his master works of art, his method of conversation reflects the same methodology. So if I interject too quickly, I get an earful and his frustration escalates. So finally at the end of the Saturday morning “show”, a peaceful conclusion was made between father and daughter and wife. Though me being who I am, an-impatient-for-this-type-of-unnecessary-prattle-when-I-have-other-things-to-do, kind of person, held on to the irritated feelings I felt I so deserved. Setting of the scene: An irritated, overstressed, tired wife–aka Rivka on Saturday morning a few weeks ago. Kitchen cleaned from the making and serving of breakfast. Refrigerator and cupboards replenished with items from Costco and Trader Joe’s. Rivka on hands and knees scrubbing the hallway linoleum. So I had to ask myself, is my ranting the type of nourishment I want to pour into and onto my marital relationship? Well, as you can see by my title, my answer was (is and always will be), no. Now I share this with you so that you, too, may recognize her should she come into your presence. For Betty F**kin Crocker is really Betty Cranker The Marriage Killer in disguise. Run for your life should she come to town! I think Betty Cranker is also a house guest at my little abode fairly often. I’ll take your heed and post a change of address to her least she cause me to be alone and looking for a roommate. I prefer my current “roommate” thank you. 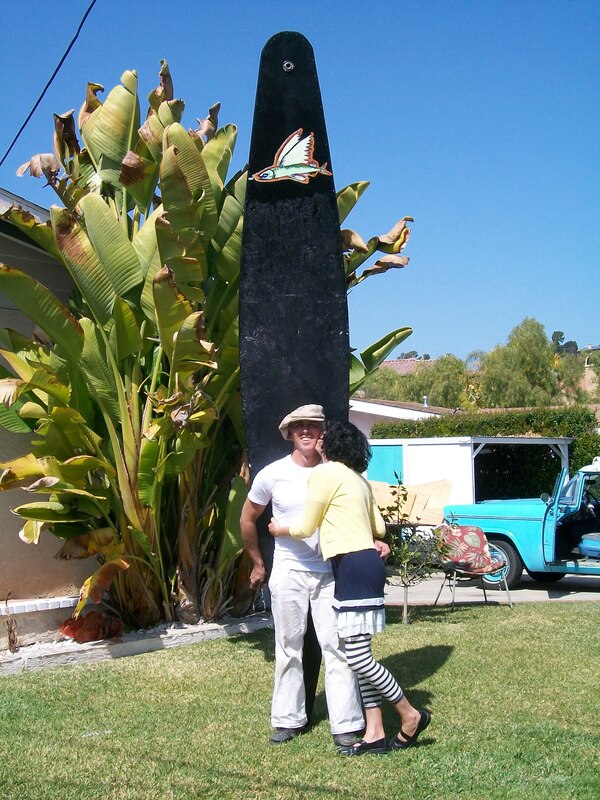 BTW, that is the biggest surfboard I think I have ever seen! How does Brian get that thing in and out of the water not to mention ride it!? Your title had me a bit worried but the ending is just what I expected and hoed for.